In my last two posts, I've focused on snowshoes, which are ideal for travel through loose, powdery snow. But in the Northeast, all that loose powder often rapidly transforms into hard-packed snow and ice. Whether it's ice-covered city sidewalks or icy above-treeline terrain, you still need some quality traction for these conditions, but don't require all the flotation that a snowshoe brings. 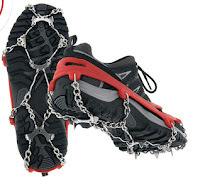 You could wear a set of steel crampons, but these are heavy, stiff, and often overkill for many conditions. Plus most aren't compatible with flexible, lighter weight footwear. 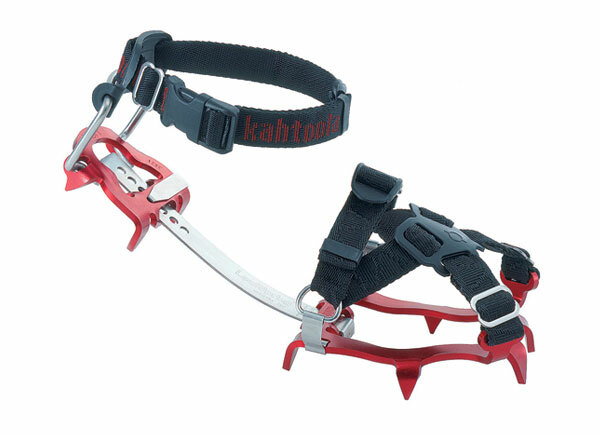 When I'm looking for something in between, I use either the Kahtoola Microspikes or KTS Crampons. These handy little traction devices ($59) consist of a series of 10 small stainless steel spikes connected by sturdy links. These are in turn attached to a stretchy red rubber "shoe harness" that encircles your boot. Simply insert your toe into the front, stretch them over your heel, and voila, you have tough mini-crampons on your feet. I have owned a pair for nearly five years and used them extensively on ice-covered city sidewalks in Alaska and elsewhere. To a lesser extent, I've also used them in the winter backcountry. They have proven extremely durable, even when used for long stretches in sub-zero weather. There a few minor drawbacks. They are not very comfortable when walking directly on pavement or rocks. They also are not the most secure traction if you're traversing on sloped ice; they tend to shift underfoot. Overall they are an ideal choice if there's lots of flat ice everywhere, but not the best option when there are only intermittent patches. They come in five sizes (20-28 ounces per pair, depending on size). KTS CramponsThese are one step closer to a true crampon and can handle a greater diversity of terrain than the Microspikes. They are lighter weight than regular crampons and offer a flexible connector bar that makes them compatible with any type of footwear, from hiking boots to running shoes. They come in two varieties: aluminum ($149; 19 ounces per pair) and steel ($159; 23 ounces). These are perfect for walking in most conditions, but their 10 points still are not as sharp as full crampons. In really steep, icy terrain they can skitter over the ice rather than bite into it. The steel version offers sharper and longer points (one inch versus three-quarters of an inch). A good option if you expect to encounter some hard-packed snow and/or ice conditions, but don't want to carry a pair of full crampons, which can easily exceed two pounds in weight.